Growing up my favorite subject was math and still is. I was always astounded to hear that girls were less likely to find interest in something that I loved so much. That is why I want to help nourish a love for math in my daughter starting at a young age. I am able to do that with Puppy Up from PlayMonster. *This was provided to me in exchange of my honest opinion of the product. 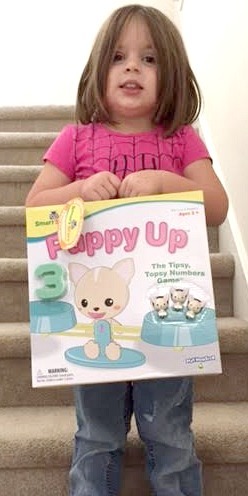 Puppy Up is a “tipsy topsy numbers game”. There are three difficulty levels of play. Each level teaches the child who is playing a different skill. The skills that can be learned are number recognition, counting and addition. The game is made for children ages three years and up. My daughter is about to turn four and she really liked this game. 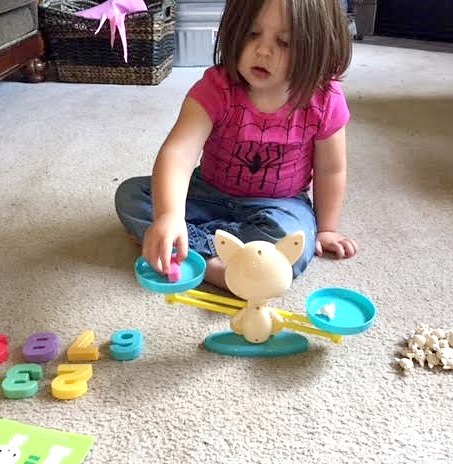 She needed help understanding some of the rules but she quickly was able to grasp the concept. 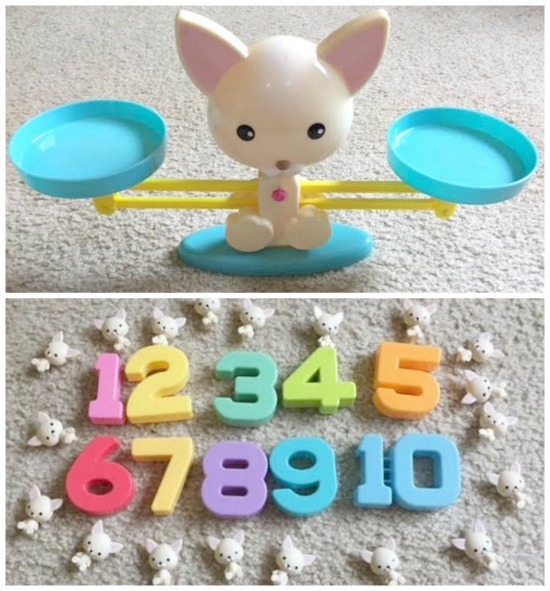 Puppy Up includes numbers up to 10. In Puppy Up the numbers weigh the same as the corresponding number of puppies. So number one is very light where as number ten is ten times it’s size but is still not very heavy. This is good because you don’t have to worry about kids getting hurt if one gets dropped on their foot. In Puppy up the three difficulty levels are represented with different colored cards. The cards are double sided and usually have a different color on each side. You can also see with the cards the different ways to play. The Purple card has a three on it so I had my daughter add the number three to one side (without telling her what it’s name was) and count how many puppies it took to equal the scale. That is when she learned that the number three was three. For the green card she found the number ten and put that on one side. Then she counted out the puppies on the card as she placed the equal amount of puppies on the other side of the scale. That is when she learned that the number she put on was the number ten. Finally for the blue cards I told her to find both the numbers and put them on one side of the scale. She had a hard time understanding why this was. It was probably because she is still a bit young to understand the concept of addition. Puppy Up is a great idea for a Christmas gift. Boys and girls of preschool age and early elementary would all love Puppy Up. I don’t see it so much as a game where someone can win but it is still a fun game to play to help a child learn these number concepts. My almost four year old daughter loved playing Puppy Up. My two year old son also got in on the fun by just playing with the scale. Who do you know who would love to get Puppy Up for Christmas?